Started the day with a trip to Waitrose for coffee and a croissant for breakfast and to pick up a few supplies – I wanted to buy the whole shop but was fairly restrained. Headed out of Monmouth and the whole day today was going to be on the Offa’s Dyke Path with my destination being Pandy. It was forest tracks initially and then fields for the rest of the day. Nothing of any note happened for the first half of the day. Not long after my fresh quiche and salad courtesy of Waitrose the cloud rolled in and just kept coming. 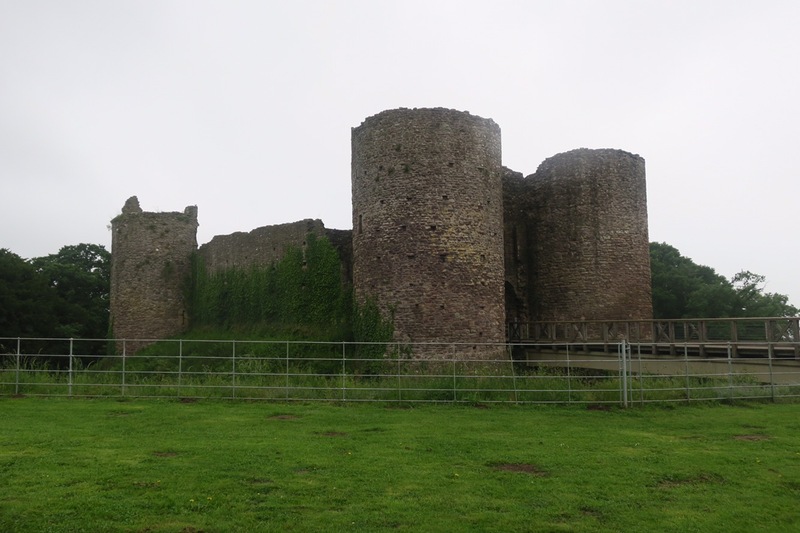 On the route in the afternoon was the massive White Castle; built to defend Wales in the 12th and 13th centuries. It is mightily impressive but remarkably low-key i.e. no entry fee, cafe, compulsory gift shop or medieval reenactment – just a few information boards. I visited briefly but due to the rain I didn’t hang about. Soon after, I met a couple of guys who had almost completed the Offa’s Dyke Path from the north and were fellow campers. It turned out they had stayed where I was headed for, but they were very disparaging and warned me off. 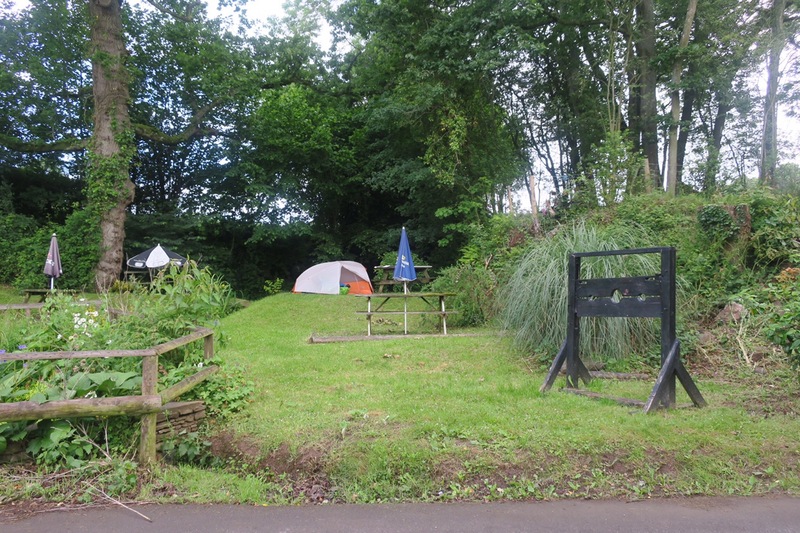 Instead they recommended the Hunters Moon Inn in Llangattock Lingoed and they implied that camping was offered (free of charge!). Even if the free camping turned out to be non-existent I thought it would be rude not to stop for a cheeky pint – any excuse for a rest out of the rain. I stumbled in dripping wet and bright red from legging it up a steep hill in a field of cows with calves just moments before. I was greeted by a cacophonous crowd of 8+ local farmers. They were naturally inquisitive and kind at heart but a little intimidating on mass with their accompanying (slightly incoherent) banter. I was soon accepted in and was bought a pint of the tasty local Skirrid ale – named after a local hill. Also, the free camping was not apocryphal and I was offered a spot on the lawn in amongst the picnic benches and umbrellas. They say good things come in threes: free beer, free camping and finally fantastic food. I had (very) local lamb chops and bread and butter pudding – scrummy! Rest assured I gave them a good tip. 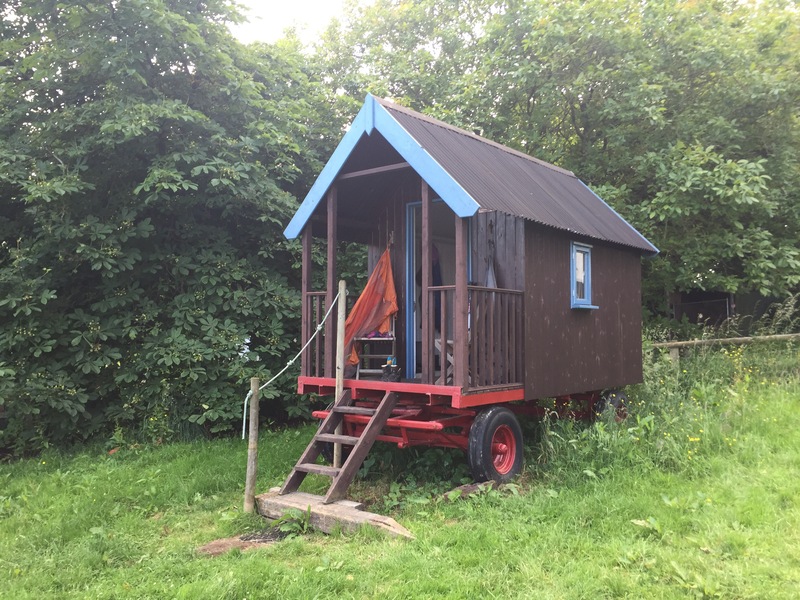 At 9 I bid goodnight to the staff, the farmers and an American couple; Elizabeth and Steve who were doing a 2-week tour of the Welsh borders, including walking about 80miles of Offa’s Dyke and seemed unperturbed by the wet weather. (Hello if you’re reading, hope you enjoyed the rest of your trip!). I rose early after a slightly unsettled night and knew that I had a long day ahead of me so off I trotted. It was a dry morning – a relief after the previous dank afternoon/evening – as I headed down to Pandy. From there it was up on to the Hatterrall Ridge – a 10mile ridge at 450-700m, where I would be spending the majority of my day. Despite the climb (probably the biggest single ascent of the trip so far, although not huge), I was really looking forward to being on the high ground for a prolonged period to enjoy the views. The route up turned out to be much gentler than I expected and so I merrily started the march along the top. And it was then that the wind picked up, and kept up all day. It was a strong crosswind from west to east (gusting at 40-50mph was the forecast) and it buffetted me about, in part due to it catching my big pack. Then it threw in the occasional short but heavy shower. The wind was relentless and I was starting to get weary of its persistence – there was no danger, this was a very wide grassy ridge – it was just frustrating. At one point I think I shouted “will you just stop?!”. 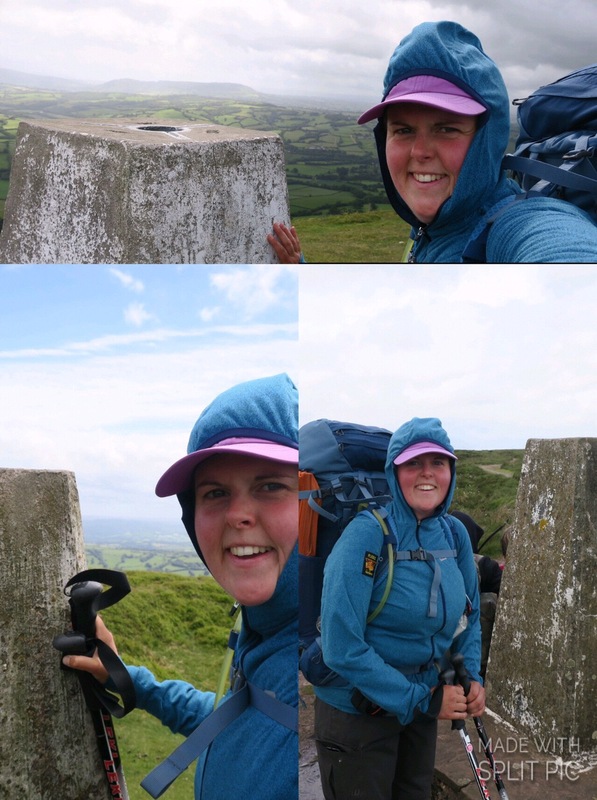 So it didn’t turn out to be the slightly whimsical and awe inspiring walk I expected, instead, it was a head down and crack on walk but I did my best to take in the views as they were stunning! Coming down on the sheltered side of the ridge, I thought I would get some peace and quiet, I found a sweet spot where I could finally hear myself think, but it only lasted a couple of minutes. The rain started again but I found a number of companions to chat to for the 3mile descent into Hay-on-Wye which helped pass the time. At the campsite the proprietor and I were looking for a spot (with morning sun to dry the dew) within a lovely natural orchard area when we went past a glamping-type wagon. Reading my weary face she said “would you like to stay in there? I’ll give it to you for just a couple of quid extra”. For a moment I thought, I’m a camper not a ‘glamper’. But that thought soon evaporated once I’d seen inside…sold! Being Sunday evening, there was nowhere to pick up dinner supplies so I dined in the Three Tuns that evening (recommended) and I bumped into 2 chaps (John and Richard) who I’d met earlier coming off the ridge. John had walked JOGLE (LEJOG the other way round) before he retired and Richard had grown up in East Sussex so we had plenty to chat about. They invited me to dinner but they were meeting friends and I was writing my blog so I politely declined and messily munched my way through a delicious mackerel and anchovy pizza – probably best I didn’t have company! After a long day and being gifted an extra comfy bed, I couldn’t resist a little lie in! After which I set off in a buoyant mood, quite chatty (to myself – standard), and enjoyed being by the river. The path rose away from the busy A road and river and gifted nice views looking back over yesterday’s walk. The walk was hillier than expected but I just kept going – one foot in front of the other. I think that yesterday’s effort was starting to catch up on me and by lunchtime I was quite foot sore. I knew that the next set of maps were waiting for me at the Post Office in Kington and that it closed at 5:30 so if I wanted to use them in the evening to plan ahead I would have to start getting a move on. However as the afternoon wore on my feet got more sore and I was taking more little breaks to try and relive the pressure, so it was at this point I decided I would stay in Kington an extra night. 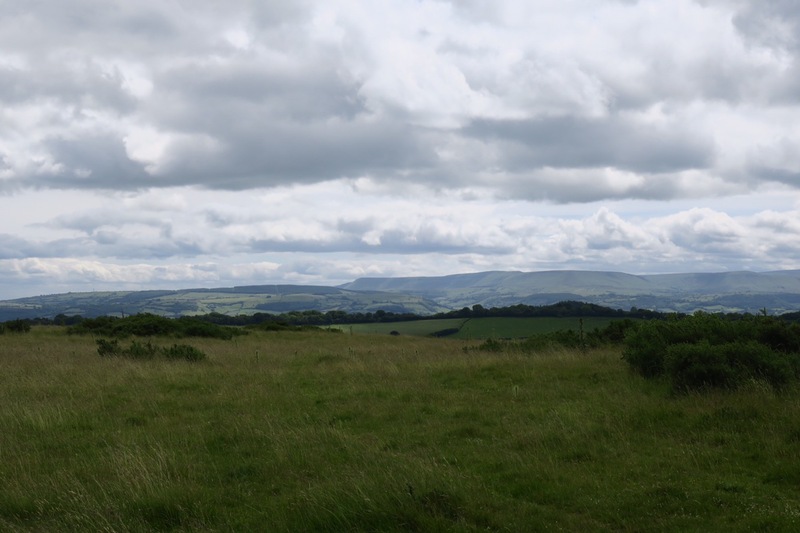 With the time pressure alleviated I ambled my way through the fields and over Hergest Ridge. 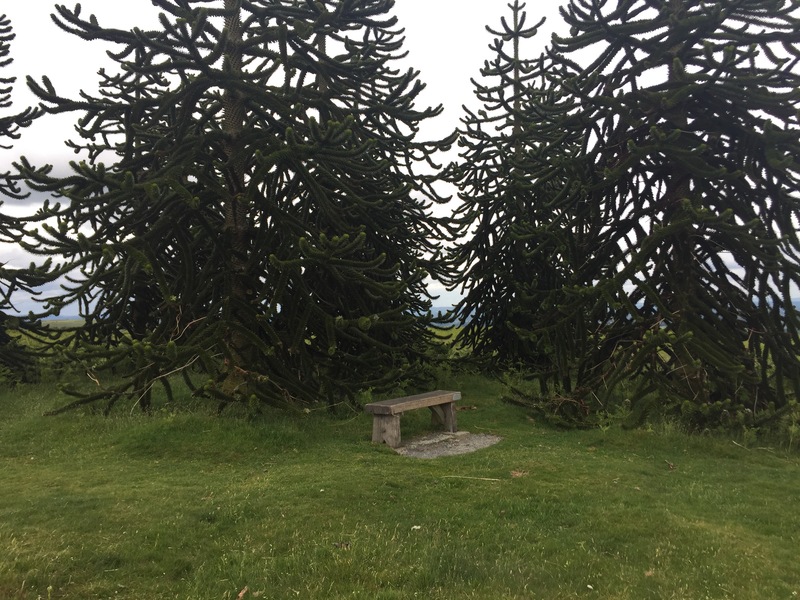 Hergest Ridge is a curious place; an area of open moorland with the highest point of 426m (although the trig is at 423m), a small clutch of monkey puzzle trees, a whetstone that is claimed to have ‘wandered’ over from a neighbouring hill and finally the visible indentation of an old racecourse. I’m not sure which of these features inspired Mike Oldfield when he settled on the name for his follow up album to Tubular Bells. Having just listened to the 20minute title track, his inspiration could have had something to do with a substance he took and not just the moor. I virtually hobbled into the YHA and was greeted by a lovely couple and first time volunteer wardens. I did some washing, cooked a normal meal(! ), ate said meal, went for an evening walk to stretch the legs and went to bed. At about 7pm John and Richard walked in and we compared notes on the day’s walking which they thought had been tough too, so I felt a bit better. Before he left, John suggested we could meet up again in the Peak District and he could put me up for a night in Sheffield should I need it! One more day on Offa’s Dyke and the last day of section 2! Sounds like you are enjoying yourself. Hope the weather eases up this week!